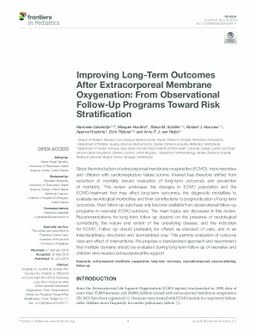 Since the introduction of extracorporeal membrane oxygenation (ECMO), more neonates and children with cardiorespiratory failure survive. Interest has therefore shifted from reduction of mortality toward evaluation of long-term outcomes and prevention of morbidity. This review addresses the changes in ECMO population and the ECMO-treatment that may affect long-term outcomes, the diagnostic modalities to evaluate neurological morbidities and their contributions to prognostication of long-term outcomes. Most follow-up data have only become available from observational follow-up programs in neonatal ECMO-survivors. The main topics are discussed in this review. Recommendations for long-term follow up depend on the presence of neurological comorbidity, the nature and extent of the underlying disease, and the indication for ECMO. Follow up should preferably be offered as standard of care, and in an interdisciplinary, structured and standardized way. This permits evaluation of outcome data and effect of interventions. We propose a standardized approach and recommend that multiple domains should be evaluated during long-term follow up of neonates and children who needed extracorporeal life support.